1. 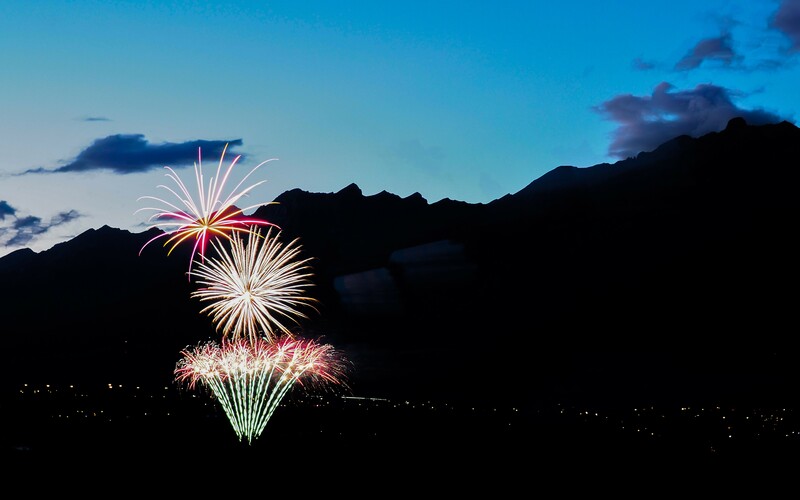 Canada Day Fireworks – For the second year in a row, at about 10 o’clock on July 1, we headed out to a small bluff above the Three Sisters Parkway near Canmore (Alberta, Canada) to wait for the 10:30 Canada Day fireworks display. Individuals aren’t allowed to set off fireworks in Canmore, so the only option is to watch the official fireworks show. We think the secret’s been slowly leaking out, because there were way more people at this viewing spot compared to last year. The biggest benefit of this viewing spot is that there isn’t a big traffic snarl to deal with after the show is over. The biggest disadvantage is that even with a pretty decent zoom lens, it’s hard to come away with an image full of fireworks. Anyhow, we had fun and came away satisfied that our fireworks photography is slowly improving. I guess it’s kind of hard to get better fast when you only have a couple of chances to practice each year. 2. Walking and Talking – According to Fitbit, we got out walking and talking at least 20 days this month. 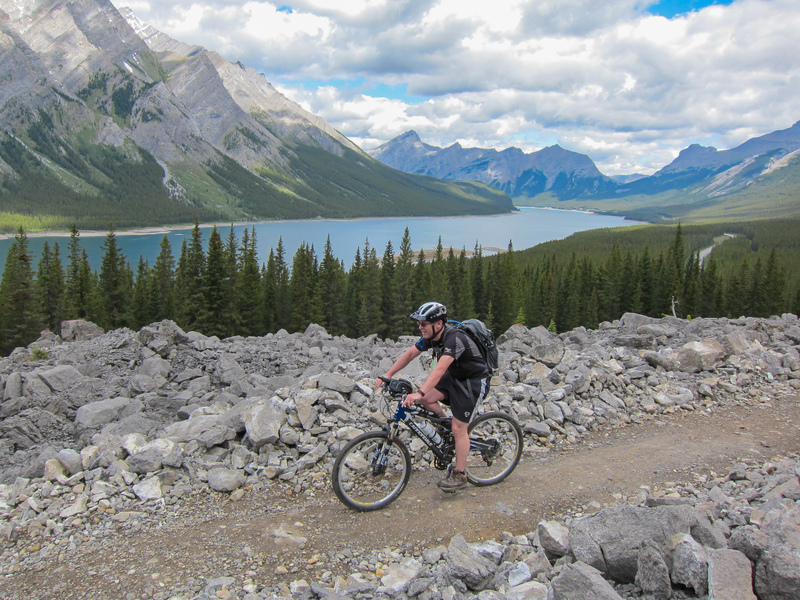 Most often it was in Canmore, but a few days it was our mode of active transportation while doing errands in Calgary. Some days we didn’t talk much; other days we did. Most days at least one of us took a photograph of the other. 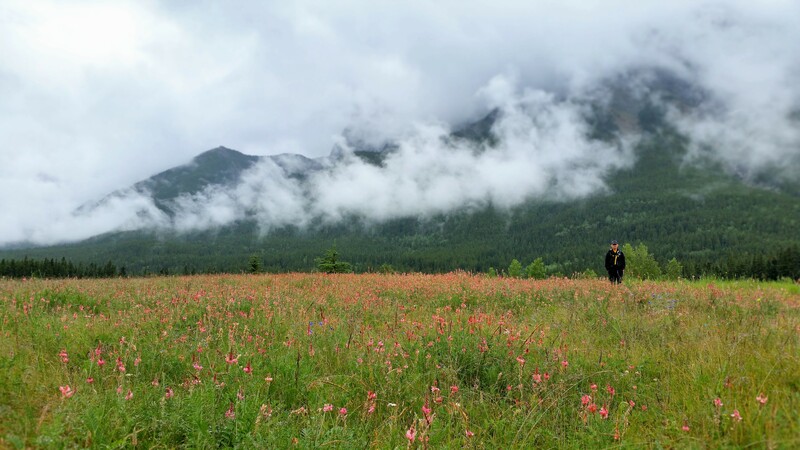 I selected one that shows it’s not all sunshine, blue sky and big mountain views in Canmore; it was taken during a very rainy morning walk in Canmore, along a route that included a huge field of wild clover and other pink blossoms. BTW, I’m pretty sure we’ll be doing a lot of walking and talking once we’re officially empty nesters. 3. Geocaching – We found eight geocaches this month, all while out walking, hiking or biking. This photo is from the day we tried the new High Rockies Trail and managed to be first-to-find (FTF) a recently placed geocache. 36 km (22 miles) is a long distance to ride for one geocache, so it’s a good thing we were out mainly for the exercise! I don’t think geocaching will be a major focus of our empty nester phase, but we’ll continue to geocache opportunistically and when traveling. 4. 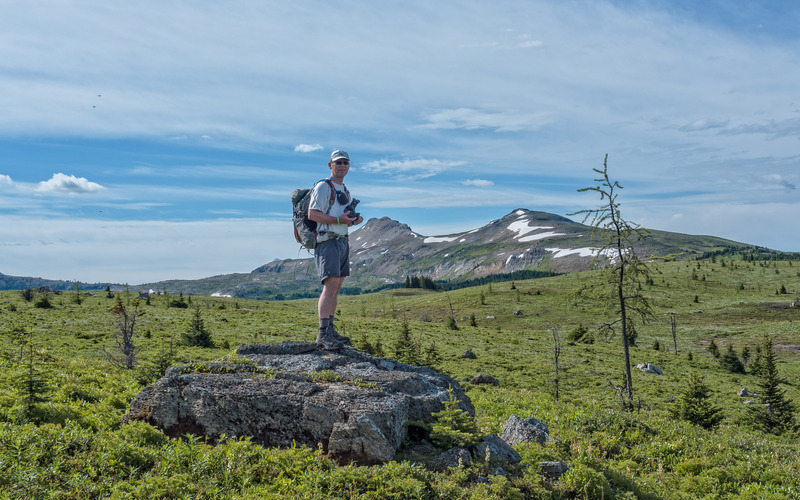 Hiking – I have a torn ACL and am waiting to find out the date for my knee surgery. So we’re doing more biking and less hiking this summer. I took this picture of Mr. GeoK during our hike to Citadel Pass. After I work through the post-surgery recovery and rehab phases, we’ll get back to doing more hiking. 5. Biking – Mr. GeoK has been thinking about getting a new bike for a couple of years now. 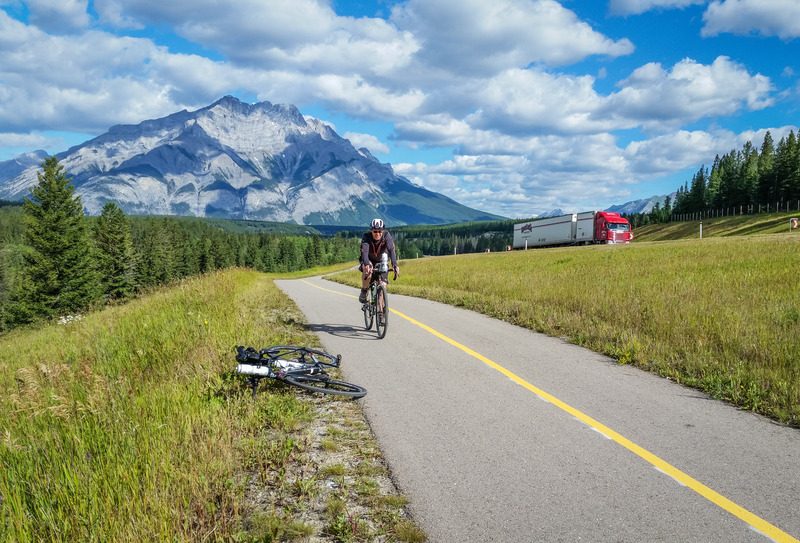 It’s fun riding mountain bikes, but we mostly ride on paved or gravel trails (nothing too technical), and to move a mountain bike at any sort of speed on a paved trail you have to work pretty hard! So he’s been researching cyclo-cross and gravel grinder bikes. And in July he finally invested in a new bike – plus one for me! We’ve been having an absolute blast riding our new, closer-to-road-bike bikes and did our longest ride ever (73 km / 45 miles). Mr. GeoK told someone the other day that riding his new bike is the most fun he’s had on a bike since he was a kid! This picture is from one of our rides along the Rocky Mountain Legacy Trail. We also have a common interest in photography, which we’ll continue to pursue once we’re officially empty nesters. 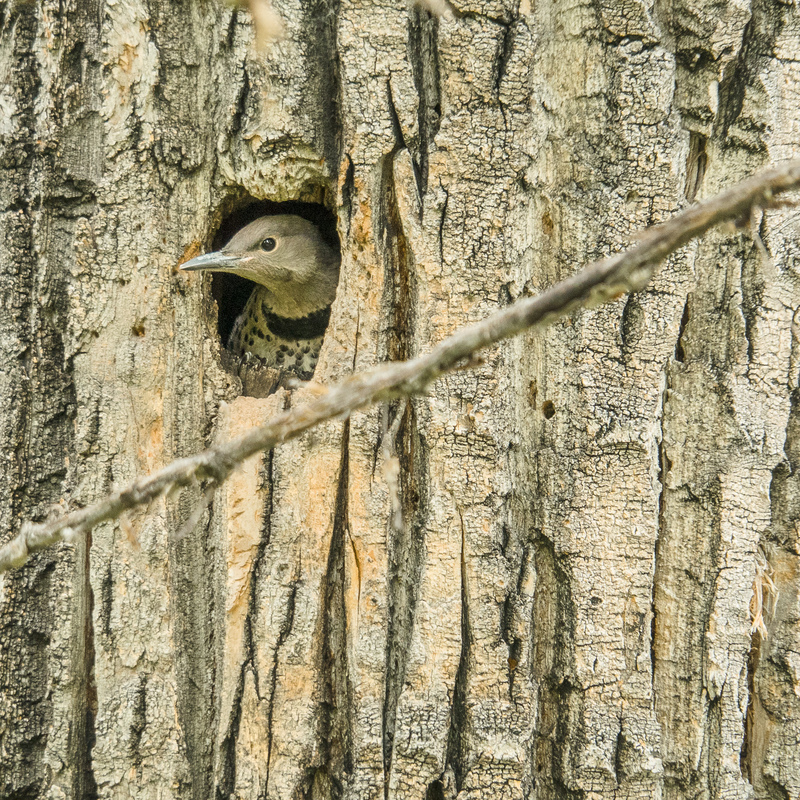 This month, we found a dead, hollowed out tree that was home to a pair of nesting Northern Flickers. We managed to catch them at home early in the month, but every time we stopped by after that we found an empty nest (IRL). We also watched whatever movies we wanted to, read plenty of books, soaked in the hot tub and spent time with family & friends. Of course we missed our sons and look forward to welcoming them back home, but we also enjoyed the freedom that comes with adventuring for two! Just as our trial period as “empty nesters” came to its inevitable end, so does this post. A link up to all the participants’ choice of subjects can be found here. I treat this photo blogging challenge as a month-long photo assignment, which makes it pretty low stress. New participants are welcome to join the photo blogging challenge any time. Why not join us? The August theme will be posted at A ‘lil Hoohaa tomorrow. Looks like you’re adapting to your new habitat successfully! We were empty but then our oldest went through a divorce and had to move home for a while. We’ll get there again…some day! Lovely scenery, as usual. You can ride with a torn ACL? I wish you all the best on your upcoming surgery and recovery. As always, you have some amazing photos. The scenery you have in your neck of the woods really is breath-taking. One thing I need to do is get out and exercise more and take care of myself. The biking aspect is something I really want to do more of as it can be a quicker/more intense workout setup. But I know what you mean about working a mountain bike on pavement isn’t always so great! I don’t think I’ll be investing in a new bike anytime soon, but the ones your husband got seem pretty interesting. Great work on the theme this month! And I forgot… the fireworks shot. Excellent. Love the three blasts and the background. I think it came out awesome. The one great thing about baseball games is the ability to see many more fireworks shows, though I don’t have a tripod with me for them, which makes it harder! I love your landscape (second) shot with the red flowers in the foreground leading my eye in, towards the misty mountains. Beautiful photos. Fabulous post and you live in a stunning part of the world – no wonder you get out walking and riding so much. Your fireworks shot is incredible and the scenery pictures are beautiful. I think as empty nesters you’re going to have a ball together. I love the mountains in the background. I wish I lived closer to landscapes like that. I was in Epcot on Canada Day and tried escaping the rain in the Canada pavilion. They had gone into emergency shelter mode though, so I never got to see the Canada movie they usually play there. What fantastic photos! Canada looks absolutely beautiful. Love this post so much! Nice shots and proof you can do that empty nest thing! Walking and talking sounds like a good thing to do in order to stay connected. Congratulations to your son for making that program for exceptional students, way to go! Oh wow you live in a stunning part of the world. Can’t quite decide if it is the Flicker or Fireworks I love best! That fireworks picture is one of the best I have ever seen. These are wonderful – I always love your photos and adventures. We don’t have Northern Flickers around us – that was a great shot!